Quality Measuring tools for every budget. 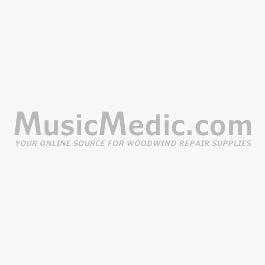 Let MusicMedic help you size up the situation! This digital caliper is perfect for those technicians who need an accurate measuring tool at a low price. This caliper is easy to use and perfect for the accurate measurement of rods, thread diameter, bore size, key heights pad cups, pads, depth of pad cups, pearls, neck tenons and sockets, springs, material thicknesses and any other application where a precision measurement is needed. This caliper also features a hold button which is especially useful for measuring pad cups on the instrument. The hold button allows you to save a measurement for accurate reading if you have to move the jaws to see the display. This caliper is very similar to the MusicMedic.com caliper and differs only in the temper of the jaws, sliding action and the casing around the digital display. An excellent choice for beginning technicians. This caliper is the perfect addition to any small repair shop. The outside edge of the jaws on this caliper will measure the inside diameter of a pad cup and quickly give a reading in inches or Millimeters. The inside edge of the jaws will accurately measure pads after they are removed from the pad cups. This caliper is also excellent for measuring the thickness of cork, felt, pads or anything else. Any woodwind tech will appreciate having a small straight edge on the bench for cutting straight lines in cork, felt, Ultra-suede etc.. We chose this tiny ruler because it give measurements in both Millimeters and 32nds of an inch. The millimeter side of the ruler shows half millimeters up to 50mm. Comes in a protective carrying pouch.